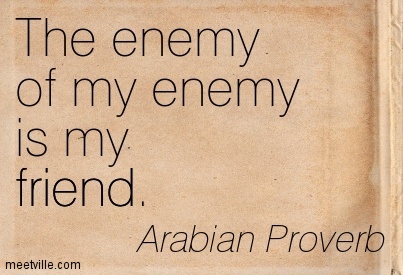 ISIS: The Enemy of my Enemy Is…? Our President is dithering and has no plan except to now work with the Syrian government he was painting ‘red lines’ about just a little while ago. Now that ISIS is showing itself to be a dangerous entity with the power, financial support, and will to carry the hard fight, the President is willing to support Bashar with his little problem. Playing in traffic like that is a good way to get hit by cars coming from both directions. The best plan is to support the Kurds, which it seems everyone agrees to, even Iran, who it seems has a very interesting motive for getting there first. Better to fight in someone else’s backyard than your own and for the price of a few weapons someone else gets to do the dying. Does that sound familiar to anyone? Iran is aware that if ISIS takes control over Northern Iraq, then Iran is very possibility next. We can deal with ISIS without helping Syria. Actually helping Syria is akin to amputation of a limb because it has a tumor. We gain nothing and lose credibility. But therein lays the rub because getting troops on the ground poses a challenge if we want heavy forces. Turkey is not doing much about ISIS. Perhaps they fear domestic issues or maybe they don’t mind the fact that ISIS is pounding the Iraqi Kurds which Turkey, having their own much larger population of Kurdish peoples, cannot do with impunity inside their own borders much less outside. Turkey’s secular government must always keep in mind the Sunni majority. They make no move while attempting to quell internal problems. They did not get stirred up over the Syrian civil war, and with ISIS close but still not attacking them directly, perhaps they are hoping it will all blow away. Turkey probably would not be particularly interested in allowing transit of U.S. heavy forces in order to gain access t the areas of Syria that we need and Russia is not going to allow a direct attack on Syrian soil anyway. Further complicating things, Russians have also sent war material and aid to Iraqi Kurds in support of both Iran and Syria. This situation is so full of complications and contradictory actions there is no real way to be sure what is going on unless all the parties involved start cooperating. Imagine the U.S., Russia, Syria, Iran, Saudi Arabia, Iraq, and Turkey all at one conference table debating the best way to help. The room might catch on fire. I could not envision a more complicated and convoluted situation. That does not get the President a pass by the way. He should have been at the forefront making things happen. Instead he hesitated and now we have this mess because he has no plan. ISIS has money, will, and their recruitment policy is gaining them thousands of new fighters daily. They continue to spread fear and push hard against the Kurds. The Iraqi government has not managed to do much against them so there is currently nothing realistically for them to fear. ISIS is a threat that has everyone reacting but with all the disparate nations involved, the possibility of this becoming a wider crisis between the various groups and any possibility of command and control is a pipe dream. The United States would not allow the Russians or the Iranians to actively participate in leadership of a military campaign. If a Russian close support aircraft, piloted by an Iranian, drops a bomb on U.S. personnel while supporting the Iraqi Kurds, is it an act of war, a friendly fire incident, or do they get a mulligan? The scenario is so ludicrous that it is laughable but we actually might have United States SOF in close contact and hit by ordinance dropped by Iranian pilots in Russian planes and we would just have to accept it without complaint. What happens if ISIS gets what it wants in Iraq? First they gain massive propaganda value for defeating the various forces arrayed against them. And it would be a defeat if they establish their caliphate. They would be able to claim a victory that no other Islamic nation can claim. Allowing them to establish their rule would also make it harder to remove them. They would control a larger source of wealth than they do now and they could threaten Turkey, Jordan, Iran, and Saudi Arabia directly and every disaffected Sunni fighter in the Muslim world would rally to their cause. The Caliphate they dream of is the successor state to Muhammad’s rule if they gain victory, they will have the religious imperative to command the Sunni population in spite of what Saudi Arabia wants. The reality is that all they have to do is survive long enough. That is it. If ISIS can hold on to Northern Iraq and Syria long enough, they can claim to have fulfilled the requirements of the Caliphate and it would be impossible to deny them. A great many people are dismissing the ISIS 5 year plan for the Caliphate. They seem to miss one problem. Most of the area they are looking at is already comprised of Sunni Muslims. Saudi Arabia created the conditions for control over the Islam. They simply did not wish to create the Caliphate. They had all the power and wealth they could ever ask for so what did they need more for? If ISIS can wrest that informal dominance away from Saudi Arabia, they become the official head of the Sunni’s; the second largest religious group on the planet that stretches from Africa to Malaysia. The 5 year plan might not be as unrealistic as some outsiders assume. The religious imperatives are what make the dynamic so volatile. ISIS brutal behavior is a statement. They intend to dominate and they will not allow any to stand in their path. They are seen as in ascension now and that is drawing more interest and swaying opinion. The Islamic world is oppressed. No questions or doubts. And the counter argument that the West has been the one oppressing them is difficult to deflect considering we have been pounding Muslims with our guns and bombs for the last 13 years. We can debate justification till Ragnarok but it is all opinion and in the Muslim world, we are the aggressors against their religion of peace. This is why we are about to engage in a multi-year war that will dwarf what the United States and allies went through in Afghanistan and Iraq. ISIS can claim the moral imperative to rule the Islamic world and if that happens, they can establish the Caliphate they desire. All they have to do is survive in Iraq and they win. We face a choice. We either commit to the destruction of ISIS now, or we fight an ever growing Caliphate as they put a strangle hold on the oil reserves and divide the world between Muslim and those about to convert or die. In all actuality, it is probably too late. Without a protracted campaign on the ground with massive force, there is no way to prevent ISIS from consolidating in northern Iraq and claiming victory. And without invading Syria, we have no way of putting the force where we need it. So we can help Syria, aid and abet a regime that has been our enemy for decades in order to fight ISIS who will be our enemy for decades to come if we don’t do something. Or we can jump start the entire process by invading Syria in order to strike at ISIS and really get WWIII off to a good start. Now you know why the President does not have a plan. The only options are bad and worse.